Description: Leading up to his 4th year at Hogwarts, Harry is taken by his friends the Weasley family to see the Quidditch World Cup. So once again we have a new Harry Potter and once again we have a completely different movie than the former. With Alfonso Cuarón out of the picture we now have Mike Newell. Whereas Cuarón played very much on the horror aspect of the franchise, Newell's approach is much more grounded in traditional fantasy. That said, this is also a story in which we get a lot more information on magical creatures, and some more insight into the politics of the wizard society. Of course the main event(s) of the story is thus: Harry is back at another year at Hogwarts, everything seems quite simple - they even cut out the Dursley's this time around. Which is quite refreshing, as the stories were getting rather formulaic. This time, Headmaster Dumbledore announces that Hogwarts has been chosen as host for a major competition called the tri-wizard tournament. What it basically is, is some kind of Olympic Championship wherein the three biggest schools of wizard society participate in skill. This also gives us a little bit of insight - not much though - in international wizard relationships. 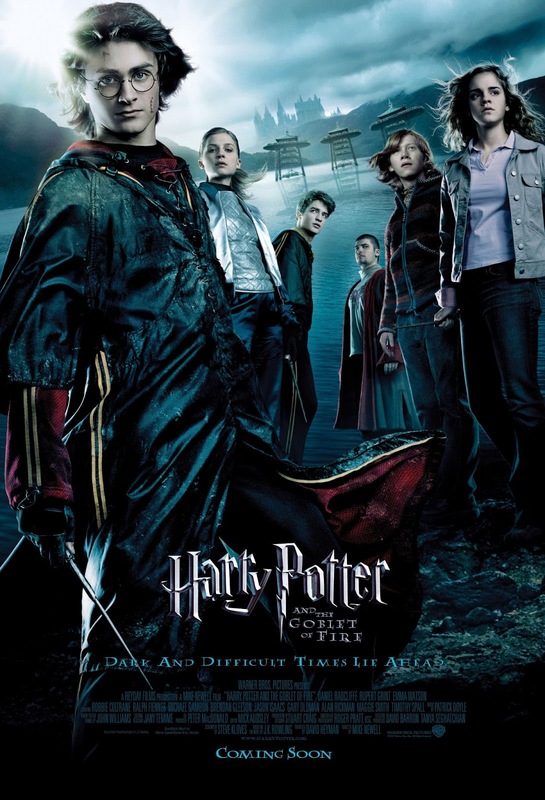 This is something this movie is the first one to do, in the books however we did get the odd mention of international wizards when Harry read the news. A running gag seems to be middle-eastern countries refusing to give up flying carpets. In any case, none of that has been mentioned in the movies and here we get our first meet with international wizards. We get the french school of magic for girls, Beauxbaton. Apparently all girls at Beaubaton must wear revealing capes and make suggesting gestures towards the men of Hogwarts. Where Cuarón had changed a lot of stuff from the second movie to his own, this movie curiously enough decided to stick with his changes - the character (played again, by Warwick Davis in what should have been a cameo appearance) that's never referred to as Professor Flitwick in "Prisoner..", merely "the conductor", suddenly lends it's appearance as what would become the permanent appearance of Flitwick for the remainder of the movies. Another consistency is the color-scheming of the movie, as this also settles very much in the grey and light-blue patterns. Albeit a bit more colorful than "Prisoner". As for the acting, I can finally tell that a lot of these actors have grown into their roles. I have to say though, if there's one change from the books to the movie I wouldn't have minded it would be the removal of Cedric Diggory. Cedric wasn't much of a character in the book and being played by stone-faced Robert Pattinson in the movie version certainly doesn't help his cause. I would call him a two-dimensional character, but that would argue he had a character to begin with. As such I would hereby like to grant Cedric Diggory the prestigious "Pointless-character-brought-into-the-forefront award". Congratulations Cedric, may this award be as rare as it is snarky. Is this a bad movie? No it isn't. It's saved by the interesting plot that the book had - but trust me, it doesn't really have much else. It serves to move the plot forward, but whereas the former stories had such pronounced themes, this one just kind of happens. It's a spectacle movie first and foremost, and by now most of the audience had started using the "Might as well finish the series when I got this far" excuse, giving the company leisure enough to not really try anything out or go all-out. While still attempting to make the movie bearable or entertaining enough to not completely bore it's audience. It's a shame, because the story could have offered so much more. As it stands, this leaves me with the feeling that the quality of these productions had started to stagnate.